Whether they are private pools, community pools, or inflatable pools, swimming pools can be the site of accidents and injuries. Often, these are injuries to children. Under Illinois law, public pools must have lifeguards on duty. In some cases, however, drowning occurs in spite of the presence of a lifeguard. Other common injuries include electrocution, infections, slip and falls near the pool, broken bones, or lacerations. If you or your child is hurt at a swimming pool, you may wish to enlist a premises liability lawyer to pursue a claim or file a lawsuit against a property owner or another responsible party. The Chicago swimming pool accident attorneys at Moll Law Group are available to represent you in negotiations with insurers or at trial against a negligent property owner or manager. Drowning is a leading cause of unintentional injury in the United States. The Centers for Disease Control and Prevention (CDC) has reported that one out of every five people who die from drowning are age 14 or younger. Many more children are treated for non-fatal submersion injuries, such as brain damage that results in learning impairments or the loss of motor skills. It takes very little time for a child or vulnerable adult to drown. All people, especially caregivers, should be cautious around swimming pools. If you or your child suffers a serious injury or a tragic death, you may hold a negligent or reckless property owner accountable by filing a premises liability lawsuit with the assistance of a swimming pool accident lawyer in Chicago. These lawsuits may be appropriate when a swimming pool owner does not follow regulations related to the type of pool where the accident occurs, or when the pool or an aspect of the pool is not maintained. In Illinois, you may hold a property owner responsible for injuries in a swimming pool accident if the owner or operator of the pool owed the victim a duty of reasonable care, this duty was breached, the breach was the cause of injuries to the victim, and actual damages are suffered. 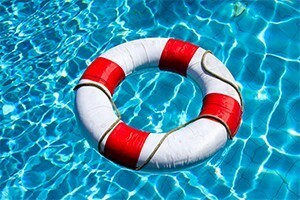 Generally, in premises liability lawsuits, a visitor to someone else's pool must establish that a property owner knew or should have known about a dangerous condition that needs repair or about which the pool operator should have warned him or her. For example, if a broken or badly maintained drain traps a swimmer and drowns her, the property owner may be responsible if it knew or should have known about the problem with the drain. Most swimming pool accident cases involve invitees or licensees of a swimming pool owner or operator. In general, only a limited duty is owed by landowners to trespassers in Illinois. However, there is an exception: the attractive nuisance doctrine, which often applies to swimming pool accident cases. When a child trespasser is a victim of an accident, the landowner can be held responsible if it knew or should have known of a dangerous condition, such as an uncovered swimming pool, that could harm a child trespasser. A landowner needs to eliminate dangerous property conditions that present a foreseeable risk of harm to child trespassers. If you have been harmed by a careless property owner, the Chicago swimming pool accident lawyers at Moll Law Group are available to represent you in negotiations with property insurers and at trial if necessary. Our firm represents people in Wheaton, Naperville, and Schaumburg, as well as throughout Cook County. Billions of dollars have been recovered in cases in which we have been involved. Call us at 312-462-1700 or use our online form to set up a free consultation with an injury attorney.